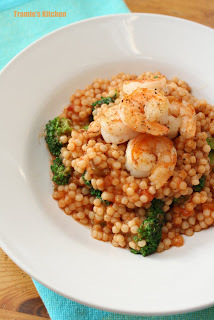 Ptitim, also called Israeli couscous, is my new favorite pasta! There is a slight chewiness to them that is very pleasing to eat, somewhere between a pastina and barley. I've had them before in restaurants, but this is the first time I cook them. 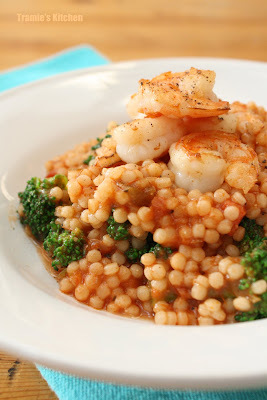 They really keep their shape through cooking, reheating and they don't clump like couscous. They cook a tad faster than other pasta because of their small shape, and the sauce really cling to them. It's awesome! Boil the water, then add the ptitim, and simmer covered, for 10 minutes. Drain under cold water, set aside. In the same pot, heat olive oil over medium high heat, sauté shrimps just until they turn opaque (which means they are cooked) sprinkle the salt, pepper and chili flakes, stir around to coat, set shrimps aside in a bowl. Use the same pot & add the sauce over medium low heat until it starts bubbling. Add the cheese, it will thicken the sauce. Stir to mix well, then add the ptitim.